Shunt-based current measurements under harsh environmental conditions: The CSMshunt device family extends the application range of CAN- and EtherCAT®-based AD MiniModules from CSM. 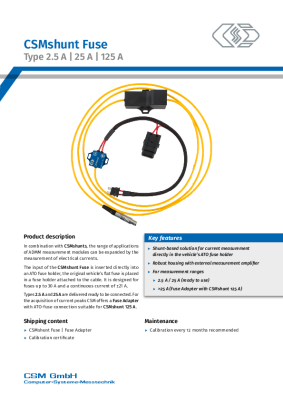 In conjunction with AD MiniModules, CSMshunts provide precise and safe current measurements from on-board power supply systems and electrical consumers in general. CSMshunts are directly looped into the current path that is to be measured. 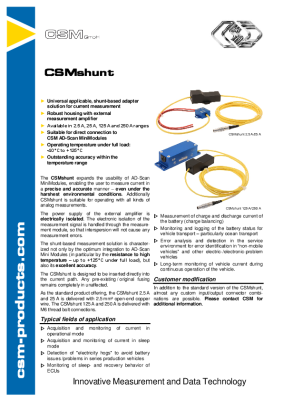 With additional voltage tap-offs, combined voltage and current measurements are possible. CSMshunt fuse for use in a vehicle's fuse box. The safety provided by the original vehicle fuse is maintained! In conjunction with the high-voltage safe measurement modules HV ADMM 2+ and HV AD TBM 4+ and special sensor cables also suitable for use in high-voltage environments.